Trannon Furniture, based in mid Wales and Salisbury, is an award winning team of two Royal College trained designers, David Colwell & Roy Tam, producing a range of solid ash contemporary furniture using super sustainable fast grown local green ash thinnings from the wildlife friendly mixed habitat of Sir John Eliot Gardner's organic farm nearby. We produce a range of lounge and dining furniture including dining chairs, dining tables, reclining chairs, settees, stools, sideboards, cabinets and shelving for modern domestic, contract & heritage interiors at prices similar to outlets like the Conran Shop. Our corporate projects include conference rooms, boardrooms, cafes, restaurants and major lottery commissions for museum and gallery seating for the Scottish Parliament, National Trust, Crafts Council, Winchester Theatre Royal, Natural History Museum, Forestry Commission and Wessex Water. We have 3 design classics in the V+A Museum, Vitra Design Museum in Germany, Geffrye Museum, Temple Newsam House (Leeds City Museum), the Crafts Study Centre at Surrey Institute (formerly the Holbourne Museum collection), Science Museum, and London's Design Museum's furniture collections, and were awarded 4 Guild Marks from the Worshipful Company of Furniture Makers. Un-adorned by fashion, Trannon's timeless designs is styled by our respect for people and nature, so you can be active and healthy, while knowing that your furniture have been responsibly made. Our customers include ecological architects such as Roderick James, Steve Johnson, Jane Darbyshire, Feildon Clegg, John Christophers, Charlick & Nicholson and Sumita Sinha Jordan, interior designers and artists, as well as fellow designer craftsmen such as John Leech, John Barnard, Luke Hughes and John Makepeace. Our furniture has been featured in Netscape's Productopia website, picking Trannon's C2 Director's chair as one of the world's best, Bluedeco.com, Shima Q, Styleisland.com, Artifex, Ferrers Gallery, Artizana, Purves + Purves, Bluecoat, Grace Barrand, Beatrice Royal, Alpha House Gallery, Carpenter Oak, Mark Wilkinson Kitchens and indexes of the Crafts Council, Southern Arts and South West Arts (Arts Council), RIBA, Interior Design Handbook, Axis and FX. Shows include Collect, 100% DESIGN, Spectrum, Chelsea Crafts Fair, Mode, Dorset Art Weeks, Art In Action, Artisan (Edinburgh Festival), Country Living, The Craft Movement, House and Garden Fair, Celebration for Craftsmanship, Blenheim Palace Flower Show, Festival of Gardens at Westonburt Arboretum, RHS Hampton Court, RHS Tatton Park, Ideal Home, Burghley Horse Trial, Salisbury Festival, BBC Good Homes, and Classics in Belgium. Press features include the Telegraph voting Trannon's Contour Perspex Chair as one of the Best 10 Chairs, Kaleidoscope on BBC Radio 4, MTv, Inspirations, Living etc, Hello, BBC Good Homes, Design4Living, Elle Decoration, World of Interiors, the Right Angle, House and Garden, Homes and Gardens, Country Living, Furniture and Cabinetmaking, The Independent featuring our High Stool in their 10 Best EcoDesigns, The Guardian Space magazine, the Financial Times 'How to Spend It', FX, idFX, Interior Designer, Evolver, Icon, Concept for Living, Architects Journal, Architectural Review, Design Week, Design and Blueprint. 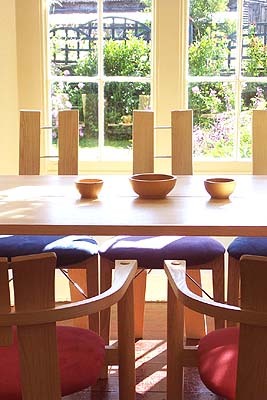 David Colwell studied furniture design at the Royal College of Art and became tutor at John Makepeace's Hooke Park Eco College as well as visiting tutor to Parnham College. Roy Tam who lives in Sherborne Dorset, was one of the pioneering year of the Industrial Design Engineering course which fostered a lasting link between the Royal College of Art with Imperial College, winning the Braun International Prize for Industrial Design, joined the Design Council's Kite Mark selection panel, and then studied under David Colwell at John Makepeace's Hooke Park College, now part of the Architectural Association. Trannon employs the most direct route from tree to product. In summer 2003, we received Envolve's Sustainable Businness Award. Eco furniture at its best! Trannon have now moved from Wilton. We both look forward to hearing from you.